Operating across London and the surrounding areas, City Dining is a dynamic, energetic event catering company. We offer an extensive range of food and beverage solutions, with catering services that include permanent workplace and buffet catering, delivered hospitality, specialist private and corporate event catering. two profiles were found for City-dining.co.uk in social networks. Among other social networks the website is represented in Facebook and Twitter. 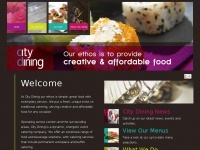 The web server used by City-dining.co.uk is located in San Francisco, USA and is run by Fastly. There are many websites run by this web server. The operator uses this server for many hosting clients. In total there are at least 136 websites on this server. The language of these websites is mostly english.